HOME > REVENUE AREA > How can I configure add-ons restrictions? This feature is only available for Premium Service, and will let hoteliers choose which rooms have access to certain Add-Ons, select sell dates and/or active period. 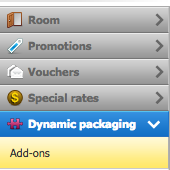 Step 1: Go to the REVENUE tab and, from the left navigation panel, select below the option DYNAMIC PACKAGING > ADD-ONS. Step 2: Create a new Add-on clicking on "New" button or select the one you want to edit and double click on it, or select the botton "Edit". 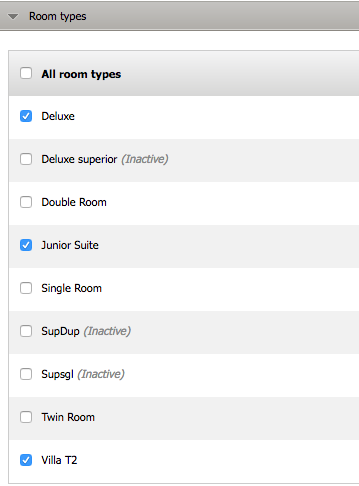 Step 3.1.: Room Type: Hoteliers can set the Add-On to be sellable only for a certain room type. For all already active add-ons, all rooms on the room type field will be checked because as a standard they were available for all offers. If your booking engine settings are set to “Promos Only”, when guests book the room on the promotion, the add-on will show anyway. Step 3.2.: Sell Date: The add-on will only be visible and buyable within the range of dates set. Step 3.3.: Active Period: The Add-On will only be visible and buyable if the reservation stay date includes the Add-On active period set. Per Night: Only on reservations that include all days of the active period will the Add-On be shown. Per Unit: If at least one day of the reservation includes a date of the Add-On active period, the add-on will be shown. Step 3.6.: Minimum children: The add-on will only be visible and buyable when the number of children of the reservation is at least the one that is set as minimum. And what about create/edit reservations on backend? Backend reservations follows the same logic that reservations from website regarding to the units that we can buy. System will select, by default, the maximum amount of add-ons allowed for that reservation. What if I try to add one add-on that is not valid for the reservation details?